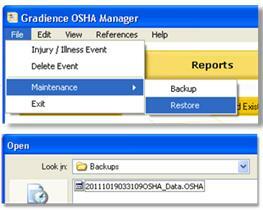 Note: It is recommended that at the very least you perform a weekly backup in the software. Backup files can be saved anywhere, including your network for safekeeping. 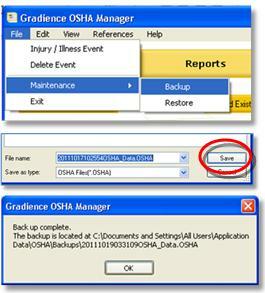 Note: If you cannot open your OSHA Manager software but do have a backup file, you'll need to rename the OSHA data file found in the location listed below first and afterwards you can open the program and restore your backup. If you do not have a backup file: You can use Windows System Restore to restore to an earlier date before your data file became corrupted. 1. First, create a backup folder to which you can back up your data. 2. In the upper left corner, click File > Maintenance > Backup. 3. On the Save As popup, browse to the folder and click Save. 4. A popup will open indicating the backup is complete and showing where it is. CAUTION! We recommend you back up your current data before restoring an older backup. This way, you can restore the backup you’ve just made if you want to return the data to the way it was originally. 1. In the upper left corner, click File > Maintenance > Restore. 2. Go to the folder containing your backups and double-click the backup you wish to restore. 3. You will get a warning that the restore will overwrite your existing data. 4. If you are agreeable to letting the restore overwrite your existing data, click OK.
5. You will get a message indicating that the restore is complete. Click OK.